Removable metal carrying handle on four feet. SKU: DH3500INOX. Category: Building Dryers. 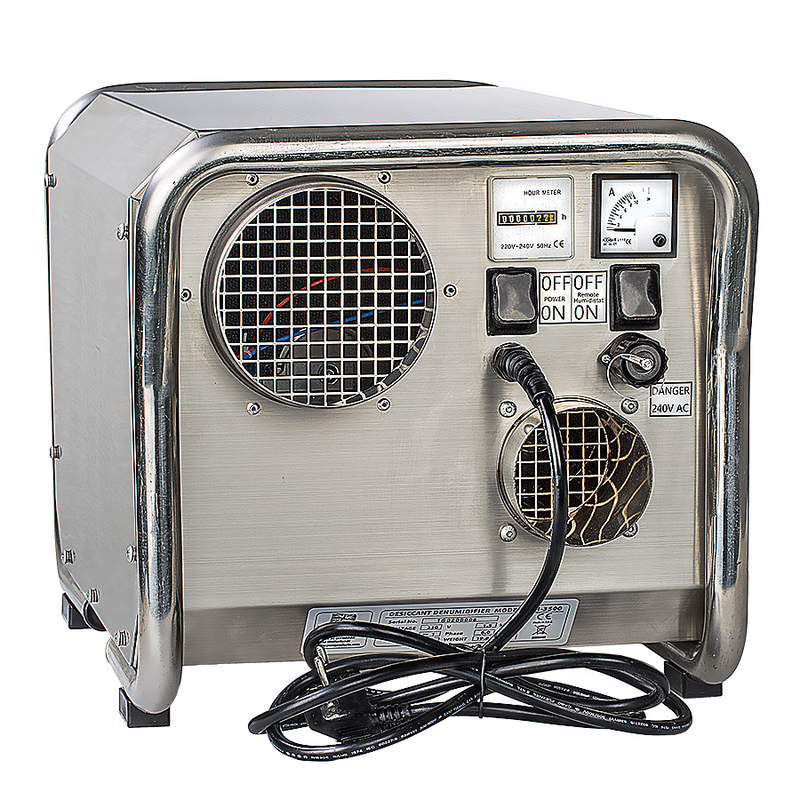 Tags: Building Dryer Dehumidifiers, desiccant dehumidifier, DryBoat® Boat Dehumidifiers. 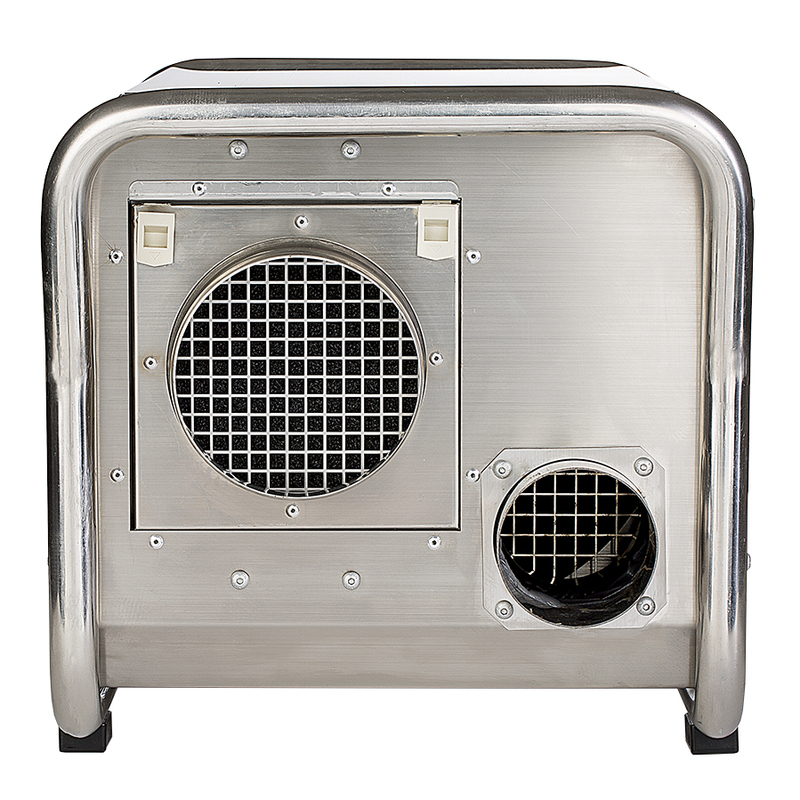 Compact size on four feet with all stainless steel construction. Used for building drying, protection of garages, warehouses, houses server rooms, industrial processes. Can be carried by one person and transported easily. – System can be pressure neutral. Ideal for closed environments where bringing outside air into the drying area is not desired. e.g. cold rooms, house lofts, crawl spaces, medical rooms, food storage, pharmaceuticals, walk in freezers. 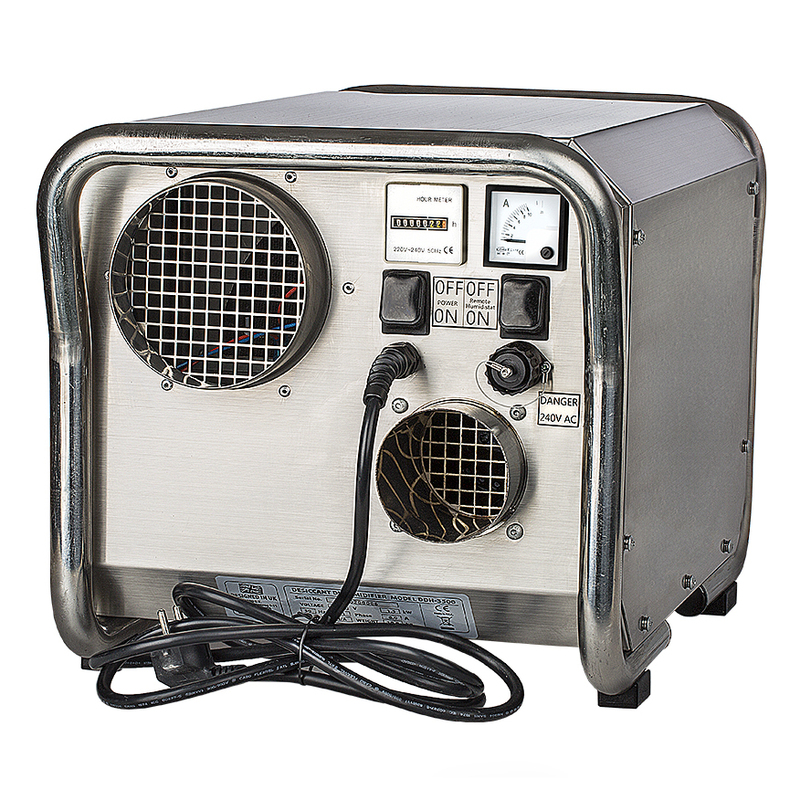 The Ecor Pro DH3500 INOX desiccant industrial dehumidifier is a great choice for hire companies, building firms or people in need to protect the environment of an area with a robust and reliable product. Perfect to dry out new builds where it will extract up to a maximum of 45 litres per day no matter what the temperature and without the need for external heaters. Works down to -20°C drying efficiently and drying cost effectively. Being compact, the DH3500 INOX desiccant dehumidifier can easily be carried by one person. Several DH3500 INNOX desiccant dehumidifiers can be transported at once in a light van or even in a normal family car without the fear of water leaks in the vehicle. The controls are equally robust & can be linked to a remote humidistat or switched over to manual control with one switch. An analogue Amp Meter means that owners/managers can review performance and measure energy consumption for claiming back monies from insurance claims or other for their operation. A run timer makes this ideal for the hire market clocking the number of hours the machine is in operation making it simple to charge per session of usage if so desired. 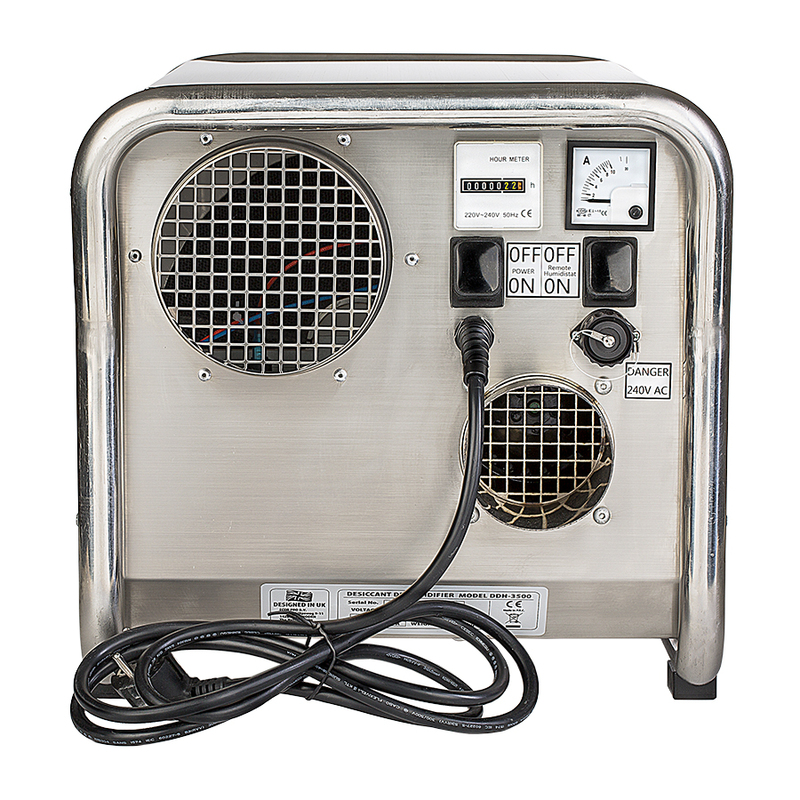 The DH3500 INOX desiccant industrial dehumidifier benefits from a simple dust filter in metal filter frame that can be shaken clean or replaced quickly replaced quickly to prevent dust particles entering the unit and impeding performance. Maintenance and eventual repair have been thought through with an easy to remove cover that gives easy access to replace cord sets or warn parts by a qualified persons quickly. Prolonging the lifetime of the DH3500 INOX is easy. An investment product for the professional user. 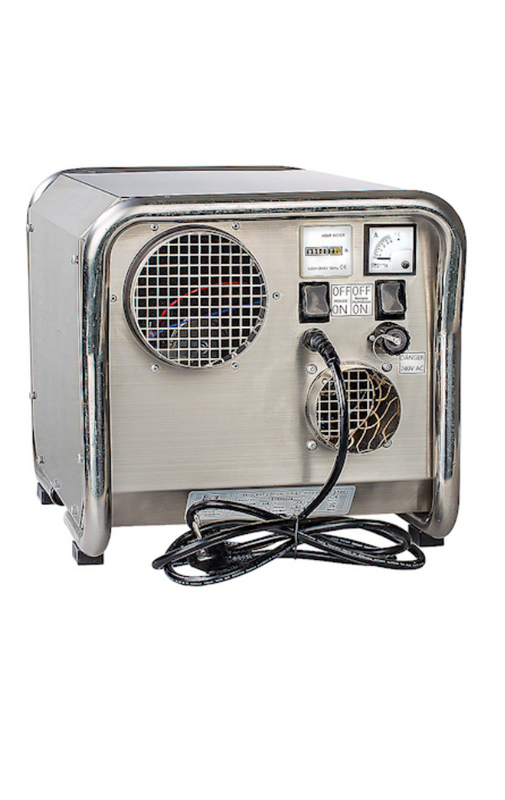 Designed to dry out areas fast, the Ecor Pro DH3500 desiccant industrial dehumidifier is ideal for flood and water damaged buildings, boat maintenance, car garages, drying wet plaster or painted rooms, work drying rooms or for keeping items dry in a warehouse storage environment. Other applications also include using the DH3500 desiccant dehumidifier in industrial processes that require drying including food preparation or remote outbuilding protection such as in electrical substations, gas or water pump houses, telephone exchanges and computer server rooms. Applications in the past have included more diverse uses such as florists, hair dressers, bakers, hair dressers, caravans, holiday homes, yachts, funeral parlours and temporary housing structures such as Portokabins. Ecor Pro’s research shows that the DH3500 desiccant industrial dehumidifier will be four to seven times faster at drying buildings at low temperatures than a traditional compressor dehumidification system those can not work below zero degrees also. What is more, it provides all this drying power without excess noise using RadiCal low-noise fan technology for super quiet operation. In drying applications the exhaust duct can be extended without loss of performance up to 6 metres. At 9 metres performance will reduce by typically 30% and at 12 metres will reduce by 60%. No damage will be caused to an Ecor Pro’s DH3500 INOX when the hose is extended. The Ecor Pro DH3500 is self regulating. – To regulate the humidity to a specific level from through a range of 40-90% Relative Humidity (RH) we recommend the Ecor Pro EPHUM220 external 220V humidistat that comes with the plug fitted & a 3m cord. This humidistat plugs straight into the front of the Ecor Pro DH3500. The humidistat can be placed in the room that requires regulating. 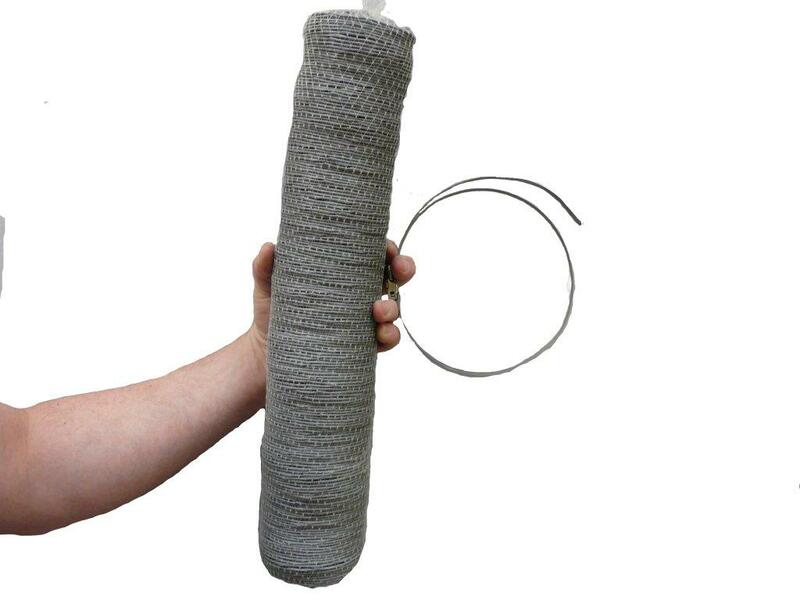 – Exhaust / Regen air tough ducting, 80mm diametre in 3 metre lengths. – Inlet and/or Outlet tough ducting, 125mm diameter in 3 metre lengths.